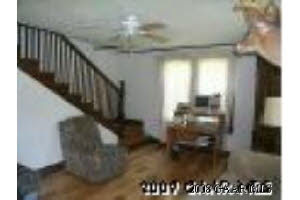 Found by Sue T, who says of this photo: "It's blurry... it has a deer.... staring at the stairs. What is going on with the railings? The deer and I are both quite amazed. Or amused. Or maybe we are all just drunk, including the railings." Well you see, I was leisurely taking photos of this house, when all in a sudden... I saw a deer! So I quickly turned the camera to take a picture, but I just caught the deer's head. You should have seen my picture of Bigfoot in that four-bedroom ranch last week. Its what the room looks like through drunk goggles. That's not a deer - it's a kangaroo. Now do you understand? Even the time stamp is blurry! Your blog is so funny. I can't stop laughing. Congrats on being a Blog of Note this week. It looks like the stairway goes into the ceiling. That's what the deer is puzzled about. The deer has turned his head to see the commotion. Someone is falling down those stairs, kicking out the balusters on his way down. My god, that's the tallest deer I've ever seen! Well now we know what escaped from that cage (http://lovelylisting.blogspot.com/2008/08/whered-it-go-howd-it-get-out-what-was.html) - the world's tallest and real estate savvy deer.